During the 7th Siargao International Gamefishing Tournament from April 24 to 28, 2014 organized by One Corporate Grand Tours, I stayed at Bayud Beach Resort, a private enclave located along a deserted stretch of coastline at the town of General Luna. Located far away from the town center within a quiet seaside village, the resort’s location obviously has its pros and cons. While its remoteness makes it a bit inconvenient to visit town or catch public transportation, it lends to the relaxed and exclusive atmosphere of the complex on the other hand. The deluxe room I stayed in was clean and spacious with a slightly rustic charm owing to its wood furnishings. The plated meals, which consisted chiefly of locally caught seafood, were homey and delicious. I particularly liked their calamares. Meals were dished out at the central dining area fronting the swimming pool, with splendid views of the coconut-lined beachfront. This beautiful resort is an ideal setting for a laid-back honeymoon, family reunion, or office outing, where people can enjoy the company of their family or friends in a natural environment. 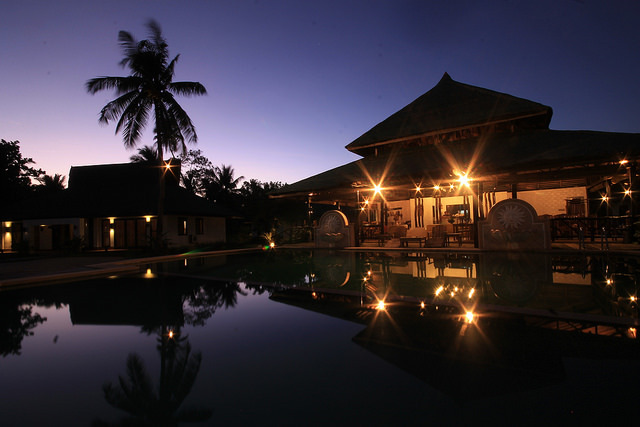 The villas and rooms are surrounded by lush tropical gardens. And true to the resort’s name – which means “wave” in the Surigaonon dialect – the Pacific Ocean rumbled on distant tidal flats. I enjoyed walking down this coralline beach, passing by the next-door luxury resort. I made it all the way to the next village where I met three children catching mantis shrimps to bring home for dinner. Bayud Beach Resort is located at Brgy. Malinao, General Luna on the island of Siargao, Surigao del Norte. Rates are on a per pax per day basis, starting at PHP 1,900/person/day for triple sharing at the Maharlika room with full board meals. The resort can arrange private transfers to and from Siargao Airport or Dapa Port at PHP 1,500 per way.